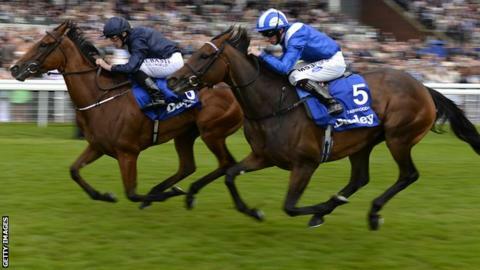 Taghrooda's unbeaten record was ended as Aidan O'Brien's Tapestry claimed a shock victory in the Yorkshire Oaks. After winning the Investec Oaks and King George VI And Queen Elizabeth Stakes, Taghrooda was the 1-5 favourite to complete a Group One hat-trick on day two of the Ebor Festival at York. But Ryan Moore kept Taghrooda in his sights aboard 8-1 shot Tapestry, who kicked for home passing the furlong marker and won by half a length. Godolphin's Tasaday finished in third. "When it comes to shocks, this one gets filed in the category marked 'major', mainly because Taghrooda had so excelled in the Oaks and King George. Perhaps the King George took more out of her than anyone realised, or she was just not quite on song here. The other thing is that Tapestry is a talented filly who is thriving, and excuses can be made for her defeat when well fancied in Ireland's Oaks last month." O'Brien said his winning filly - the runner-up at the Irish Oaks - has improved enormously since she began her campaign by coming last in the 1,000 Guineas at Newmarket. "She's come forward with every race," said O'Brien. "Last time in the Irish Oaks she stumbled coming out of the stalls and her saddle slid down to her rump. It is hard to believe she still went on to finish second. "She's a very good filly and Ryan gave her a great ride." Taghrooda's trainer John Gosden offered no excuses, saying she been "outstayed" by the winner but remains on course for October's Prix de l'Arc de Triomphe at Longchamp in Paris. Taghrooda's jockey Paul Hanagan said: "I don't think there were many excuses, she was just beaten by a very good horse."